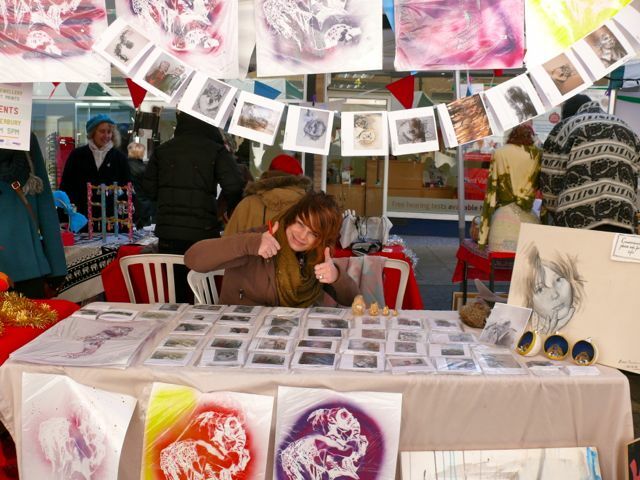 The first ever Canterbury Student Makers Market took place in Iron Bar Lane on Wednesday 12th December, with over twenty stalls showcasing original work from 40 of the city’s most talented artists and makers. This beautiful and vibrant Christmas market attracted shoppers and tourists alike with the unique combination of beautiful hand made products, hot and cold food and live music. Designed to showcase the extraordinary student talent in the city, this ground-breaking project also gave young creative makers some business and sales experience and hopes to encourage creative graduates to start their own businesses. The students had all attended a workshop during November where they learned about market trading from Gary Davies, the Market Manager, learned first-hand about the challenges of starting a craft business with local designer maker, Jasmine Hodge who has a successful design business The Font Tree based in the city and a session on business modelling with Bob Jones, from Canterbury City Partnership. The project was organised by Future Foundry, along with partners Canterbury Market, the Creative Student Network, Canterbury City Partnership and Rochester based BSK-CIC as part of Canterbury Festival’s Prosper programme. ‘Prosper is all about making new partnerships and opportunities for people in the city with a focus on the arts and creative industries. Supporting our students to use their skills and expertise and then to test their ideas on a market has been a brilliant way to involve them and help them look at how they can make a living in the future. On the day, everyone had a great time, learned a huge amount and even made some money!’ Lisa Oulton, Director Future Foundry.